My Reiki classes follow the Japanese traditional teachings of Reiki as taught by the International House of Reiki and the Animal Reiki teachings of Animal Reiki Source. As a SARA (Shelter Animal Reiki Association) teacher, I teach using the manuals of Kathleen Prasad. 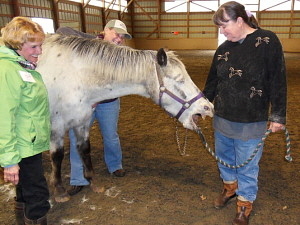 I also teach a basics class on Equine Acupressure. These lessons are the foundation of the system of Reiki. This is the beginning of a student’s journey in self-healing using traditional Japanese Reiki teachings. This one-day class is for those who want to learn how to help themselves with a daily healing practice and also help family members and friends. It's also for those who are currently trained in Western Reiki styles who wish to learn Reiki from the Japanese perspective. This class includes the definition of Reiki, its history, what it does, and its benefits. The principles and the ethical guidelines for using Reiki are taught, as well as how to heal oneself and the basics for helping family and friends. Four of the five elements of the system of Reiki are introduced and practiced: Precepts, Japanese techniques and meditations, and hands-on healing for the self and others. Reiju (a Spiritual Blessing) will be offered. A manual and certificate will be given. This is a one-day class (approximately 10 – 5). Private or group classes are available at your request. As your Reiki teacher, I will be here for any questions or assistance for as long as you need it. I am finally in a place mentally and physically where I could offer Reiki to Moon, and Linda dear, she moved RIGHT into my hands... saying HERE and HERE and HERE MORE. I thank you with my whole heart and spirit once again, Linda. I finally took the time to try this meditation. It was beautiful and powerful and I plan to do it at least daily. Thank you for everything. These teachings strengthen and provide a deeper, inner understanding and connection to Usui Mikao’s lessons. This one-day class is for individuals who want to learn more and deepen their connection and practice with Reiki, and to be able to offer healing to those not within physical reach. Completion of Shoden Reiki I or Reiki First Degree from any lineage, and continuous practice of Reiki for at least six (6) months (or when the student feels ready emotionally and spiritually) is required. After completion of this level, students will be able to professionally practice Reiki. This class includes a review of the four elements of the traditional system of Reiki: precepts, Japanese breathing techniques and meditations, and hands-on healing for the self and others. The fifth element, mantras and symbols, is introduced. More traditional Japanese Reiki techniques and meditations will be taught, including a method for those not within physical reach for healing. Reiju will be offered. an equine at The Bridge Therapy Center. and healing of the body. This two-day class is the heart of the system of Reiki. This class is for individuals who wish to heal themselves and their animals at the same time, for animal lovers who wish to deepen their connection with animals, for volunteers who want to offer Reiki healing to animals at shelters and rescues, and/or for animal body workers who wish to enhance their work with the animals. This class is based on the Japanese traditional teachings of Reiki, as taught by Frans Stiene of International House of Reiki. The focus is on healing the self so that you can help others to heal. First Day: We come together in a circle to discuss the history of Reiki, and the What, How, When, Where and Why of Reiki. You will learn and practice tools that will help you to develop and strengthen healing of the self and with the animals -- the Reiki precepts, Japanese techniques and meditations, hand positions for self- treatment, and a brief review of the hand positions for the treatment of family and friends. Second Day: We discuss guidelines and ethics for working with animals and practice the various techniques and breathing meditations with the animals. I had taken a Reiki I course in the fall but felt that I didn't quite "get it". So I jumped at the chance to learn from Linda! I know her personally and have seen her in action, working with her horse Ka.Wa. I knew she had something I wanted. Linda is calm, compassionate, thoughtful, extremely knowledgeable, enthusiastic, and patient—even with skeptics like me. She continues to learn and grow in her own practice and shares that knowledge as a gifted teacher. Although I am still on the path of understanding Reiki and its benefits, Linda has given me a firm foundation on which to build that understanding. I'm looking forward to learning Reiki 2 with Linda, and I strongly recommend her classes. Shortly after my Reiki weekend, I was out riding my horse. We were making our way down a road to a trail head when Patrick noticed some balloons bobbing and dancing in the gusty breeze. He refused to go forward, and I would not let him go back up the hill. Our compromise was to move back and forth across the road, stopping often to study the balloons but making slow progress toward the trail. After several minutes, it occurred to me that if anyone needed some Reiki support, it was Patrick! I began to meditate in the saddle, stating my intent and inviting him to partake of whatever energy he needed. Almost immediately, he bobbed his head and blew out the two loudest snorts I think I’ve ever heard. Then, completely relaxed, he proceeded down the hill and onto the trail. I will never doubt the power of offering Reiki to an animal! This two-day class builds on the groundwork of Shoden Reiki I and is for those who want to go deeper into their personal healing journey with the system of Reiki and their connection with animals using traditional Japanese meditations and techniques. It is for volunteers who want to offer Reiki healing to animals in shelters and rescues and/or for animal body workers who wish to enhance their work with the animals. This class is based on the Japanese traditional teachings of Reiki taught by Frans Stiene of the International House of Reiki. As with Shoden Reiki I, the focus is healing of the self so that you can help others to heal. After completion of this level, students will be able to professionally practice Reiki. First Day: We come together in a circle to delve deeper, through discussion and meditation practices, into the elements of the system of Reiki taught in Shoden Reiki I. Additional Level II meditations and techniques will be taught and practiced, as well as learning and practicing with the different energies of the first three symbols and mantras of Reiki. Second Day: A method for healing for those not within physical reach will be introduced and practiced. We will discuss the approach and guidlines for treating animals and take plenty of time to practice various meditations, developed by Kathleen Prasad of Animal Reiki Source, with the animals. We will discuss aspects of practicing Reiki professionally such as practitioner responsibility and intention, code of ethics. I took the Okuden Reiki II and Animal Reiki course with Linda in the fall of 2016. I found the experience to be intensely satisfying, from the quiet ambiance of the room in which we worked to her thorough answers to my questions. Linda was attentive and perceptive and guided me with grace and humor. By the end of our two days together, I felt I truly had a teacher who would aid me in my continuing growth - and a friend, as well. This one-day class is for Reiki Level II or III practitioners of any lineage who wish to work with animals on a professional and/or volunteer basis using traditional Japanese meditations and techniques of the system of Reiki. We will discuss and practice the Japanese elements of Reiki – the precepts, the first three symbols and mantras, and traditional Japanese meditations and techniques. The approach for treating animals is introduced, as well as ethics and guidelines. There will be plenty of time to practice various meditations, developed by Kathleen Prasad of Animal Reiki Source, with the animals. A Reiju (a Spiritual Blessing) will be offered to each student. This 5-hour class is for individuals who want to help themselves to help the equines in their circle of life to feel better. You will learn the What, Why, How, When, and Where of Acupressure. Acupressure, based on Traditional Chinese Medicine principles, is an effective, non-invasive method that regulates, restores, replenishes, and maintains the flow of energy, bringing the body into balance. Balance = Health. You will have the opportunity to practice acupressure points on the equine for common concerns of hoof issues, colic, anxiety, and back and hip pain. Participants must have experience of working around equines. Linda’s class was perfect. 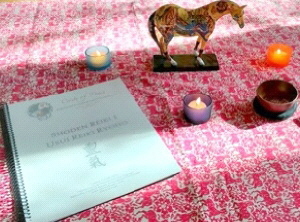 She provided the history of acupressure and its connection to Traditional Chinese Medicine; modeled how to find and hold each point, and what response to look for in our equine friend. There was definitely enough time for practice and questions. It all flowed, just like her wonderful energy~! I would highly recommend her class as an introduction to this wonderful ancient art of healing. Linda was fantastic to work with! She made this a very informative and fun day! Her loving and caring personality shines so brightly in the work she does. I can’t wait to take another course with her soon! If you wish to be placed on my email list, please notify me. If you are unable to attend a group class, I also teach on a one-on-one basis. Please contact me with questions. A non-refundable deposit of $50 is required to hold your space in class. If you are unable to attend, you are welcome to apply the deposit towards a future class. When you register for class, I will provide you with a paypal link. Classes may be pre-paid in full or the remaining balance paid at the time of service. A % of the class fees will be donated to Big Fluffy Dog Rescue. A % of the class will be donated to Peace for Ponies. Checks and cash accepted only.